The University of Papua New Guinea and the PNG Administrative College shaped the country’s independence-era leaders, providing them with the skills and personal networks to help build a nation. Now, these historic institutions will play a new role in preparing PNG’s future leaders, as part of the Pacific Leadership and Governance Precinct. They would become public service chiefs, government ministers and business leaders. Among them were future prime ministers and a governor-general-to-be. 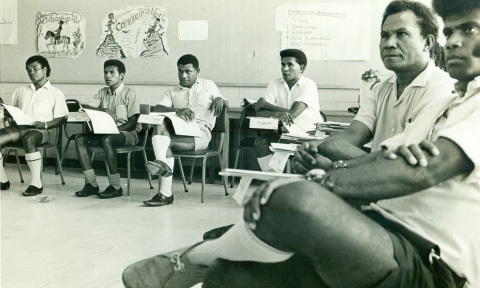 At the PNG Administrative College in the mid-1960s, a young Michael Somare – who would go on to become Sir Michael Somare, Grand Chief – and contemporaries like Albert Maori Kiki, trained for positions as senior public officials and talked into the night about politics. They started an informal discussion group known as the Bully Beef Club and began to plan for a time when PNG would be run by Papua New Guineans. Similar conversations were occurring at the newly-formed University of Papua New Guinea, where future statesmen like Rabbie Namaliu and Vincent Eri were thinking about PNG’s future as they worked towards undergraduate degrees in its first student intake. Both institutions were established by the Australian Government to meet the needs of an independent Papua New Guinea. They would be pivotal in the generation of nationalist sentiment that influenced the independence path PNG would take, and its timing. The Australian-appointed Currie Commission on developing tertiary education in PNG said a national university should be established to drive economic development and prepare the country for self-government. The proposed UPNG, the commission said in its 1964 report, “should not only be a symbol of approaching nationhood but a place for fostering of unity in a society where tribal and regional loyalties are still strong”. The Administrative College, or ADCOL as it was known, was established in 1963 with the aim of “localising” the public service. Later it became the PNG Institute of Public Administration, while legislation is currently planned to officially rebrand it as the PNG School of Government. The college focused on providing training for mid to senior level public servants, with the aim of lifting educational standards within the service and meeting departmental requirements for employees who could take on higher levels of responsibility. Certificate and diploma courses of up to two years were offered. But the college provided more than courses for bureaucrats. It became a centre for debate and forged friendships that would prove nationally significant. The group included other men who would go on to become household names. Kiki would become deputy prime minister. Cecil Abel, who taught political science at the college, would play a role in drafting the PNG constitution. Joseph Nombri became a senior public servant and was a longtime PNG ambassador to Japan. 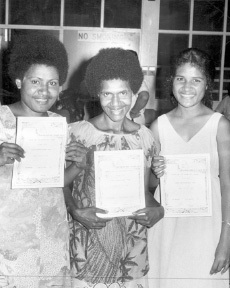 Future cabinet minister Ebia Olewale, a student leader from the nearby Port Moresby Teachers’ College, was also a member of the club. 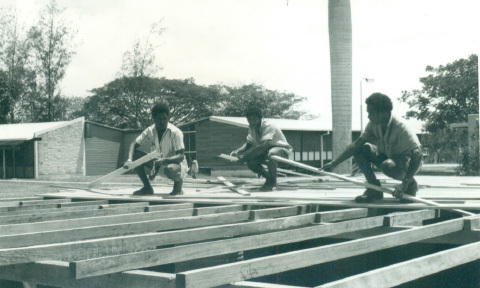 At UPNG, fifty-two men and six women commenced their studies in 1966, in a preliminary intake aimed at preparing them for undergraduate study. They were, remarked historian Hank Nelson, an “exceptional group”. Undergraduate courses commenced in 1967, with students attending classes at the nearby ADCOL due to a lack of classrooms. The university quickly became a centre of intellectual and political debate. Growing nationalism at both institutions was fuelled by a ruling that local public servants would be paid less than white officers. The decision infuriated PNG’s young student leaders and gave them an issue to campaign on. In June of 1967, Bully Beef Club members formed the Pangu Pati. The party was established on a platform of home rule, a united territory, the localisation of the public service and the use of Pidgin as the main common language of communication. The party combined with the People’s Progress Party, among others, to form government in 1972 under Somare as chief minister. On September 16, 1975 – Independence Day – he became prime minster. 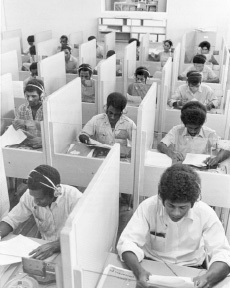 UPNG turned out its first graduates in 1970. They were a “Who’s Who of the country’s elite”, said historian Jonathan Ritchie. 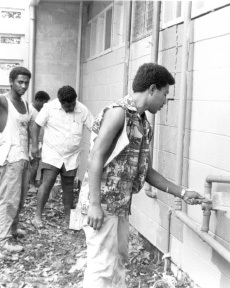 They included Namaliu and Mekere Morauta, both later prime ministers; Eri, a future governor-general and PNG’s first novelist; and Renagi Lohia, who took the reins as UPNG’s vice-chancellor seven years after graduating. Classmate Ilinomie Frank Tarua became an adviser to the Pangu Pati and Constitutional Planning Committee; Anthony Siaguru became a senior public servant; Florence Griffin went on to be librarian at UPNG and the National Library. Charles Lepani, currently PNG High Commissioner to Australia, also commenced his studies at UPNG in 1967 but concluded his degree with a scholarship to Australia. Since those early days, both institutions have played a central role in educating PNG’s public servants and private sector leaders. But due to budget constraints they have struggled in recent years to provide high-quality courses. The PNG IPA incorporated the name “PNG School of Government” into its title in 2009 in an attempt to invigorate the institution. However, it continued to face difficulties. The PNG government responded by appointing a new director in 2014, and a reform process commenced. With the new management team and Australian support, its facilities are being revitalised and its courses updated and expanded. In 2014, UPNG’s School of Business Administration was also in difficulty with insufficient space, unfilled staff vacancies and a curriculum in need of reform. Funding problems meant it was unable to meet recurrent costs, purchase textbooks or upgrade IT facilities. Now with Australian Government assistance the faculty will be transformed into a more effective School of Business and Public Policy. The school will occupy a new modern building incorporating teaching, research and study areas. Its courses will place an additional focus on good governance and policy reform, in addition to economics and business studies.